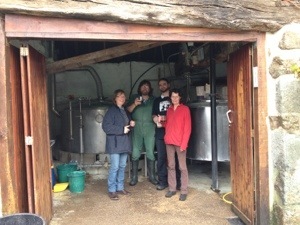 About five hours west of Lille in the farmland of Normandy is a tiny brewery called- um- Le Brewery. Former Brit school teacher Steve Skews moved here years ago to start a sheep farm. Now he has a brewery, horses, two pubs- and three sheep. At the center of the dinner table my first night were three open bottles being liberally poured: a stout from this brewery, a local wine, and Talisker. 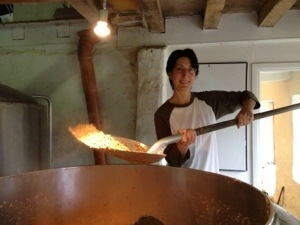 Steve brews exceptional traditional English real ales. I heard about his brewery from Swiss beer writer, teacher, and judge Laurent Mousson- and he was spot on. 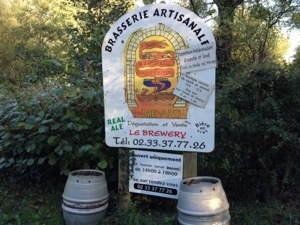 The brewery has a story you’d want to buy the movie rights to: he saved enough to bring his beer to Mondial de la Bière in Strasbourg a couple of years ago. He and his assistant lived in the tiny truck they drove there for the week- drinking their beer as meal replacements because they forgot to factor in spending money. After becoming quite “gamey” by the end of the week he found out his beer had earned one of only 10 gold medals out of hundreds of breweries! Suddenly he was the center of attention and demand- but his brewery is so small he was already at capacity. Le Brewery is at a turning point. It is ready to grow, but now that Steve has put his last child through school he’s ready to slow down. 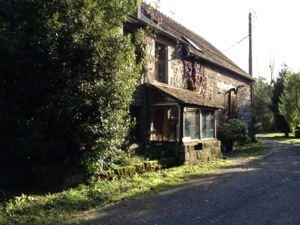 One option is to sell it, the pubs, the farm- want to buy a dream life in France, anyone? Something tells me if Kris had a little extra cash saved up there would be a small brewery in France under new management in the not-so-distant future. The trip looks amazing! Enjoy!